Have you heard about “the event”? To prepare for the inevitable, five tycoons invited media theorist and technology author prof. Douglas Rushkoff to give them some advice for the symbolic fee of half his annual income. While we see supermarkets without cashiers, autonomous vehicles and robots doing the work for us — the super-wealthy see means of protection against angry mobs and systemic breakdowns in the not-too-distant future. Indeed, the wealthy and powerful few have a much broader view of global risk than most of human society. And yet, what they can see and predict is only a fragment of the overall picture. The multi-faceted human crisis originates from a completely different cause and happens for an entirely different purpose to what they understand, which is why they think they can evade it. The actual “event” is a natural turning point in human evolution, and its origins begin no less than approximately 14 billion years ago with the Big Bang. Through billions of years, the development of matter created gases, dust, stars and planets, and then the biological life of flora and fauna on Earth. But along with the expansion of the universe, nature also works to bring all levels of life into balance: from the inanimate, to plant life, to animal life, to human life. And our turn has just arrived. Whether we realize it or not, nature is pushing us to come to balance with it. And that means becoming an integral, harmonious part of the natural system, which necessitates the evolution of human society as a collective species around the planet. Gradually, nature is amplifying our sensitivity to our global interdependence, forcing us to recognize the human network that we are all part of, and transform our societies accordingly. No technology can stop the laws of nature and no bunker can keep anyone unaffected by them. But, we can learn how to go along with the evolutionary pressure, rather than against it. To avoid becoming victims of an aggressive breakdown of our current culture, we have to acknowledge and prepare ourselves for our inevitably connected future. People have to learn about the laws of nature and how they form an integral system, where every element depends on its balanced connection with the others and how it complements them. But that’s the just the beginning of humanity’s transformation. It’s no coincidence that in the last few decades there is a growing body of research from multiple fields confirming that positive human connections make us smarter and better in every sense, as well as happier and healthier. Human beings will have to discover and activate their inherent wiring for connection by consciously practicing it. The more we practice our positive connections — personally, socially and globally — the more we see that we are coming to balance with the laws of nature, and that will become our new source of fulfillment. Surely, the transformation of human society will require a massive socio-educational endeavor around the planet, using our media and our technologies in a new way and for a new purpose. The irony is that precisely the people like those who met Rushkoff have all the means necessary to make this happen. 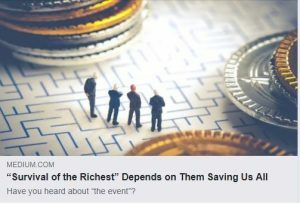 What they lack is only the understanding that the only way to save themselves from “the event” is to save human society as well. So true.indigenous Peoples of the world have been saying this since time immemorial. It’s time for us all to take heed. Our survival depends on us loving, protecting, and honouring Mother Earth. Our survival depends on us understanding our interrelationship to one another and that we all need each other. It is a great tarks for us all ,but unfortunately many only concern for their on well being. I comment the efforts of the few for this global unity.No matter the number of the few ,we wouldn’t relent our efforts. Hail to A UNIVERSAL BROTHERHOOD bonded by the power of LOVE. I hope to help humanity in this time. If there is anything I can offer, please let me know. I am very poor, so I can only offer myself.